It's such a cloudy and rainy morning; I just love the thought of sitting at my computer and writing all day. If that were such a thing. Right? Yesterday, I needed to go out and purchase some tea. I have a slight addiction to tea and all different flavors. 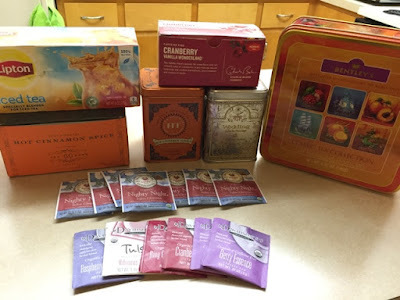 I have a friend from Wisconsin who also is a tea junkie. We send each other tea bag back and forth, so we can try different flavors, ones we like, ones we're not fond of, etc. She sent me some delicious flavors, so I went on a mission to find the tea she sent. Of course, I found this great little store that had the tea she sent me and tons of other tea; I had to have. Isn't it like that? The woman at the store was super sweet and knew her teas very well. I was impressed and thankful for her ability to help me find tea. I have already have a small package getting ready to ship to Wisconsin. The store even carried singlets of tea for thirty-five cents, so you could try out the tea, rather than buying a whole package. That drives me crazy to buy a whole box and then hate it! They had tons of delicious dessert tea, which I can't wait to try. I bought several flavors including Raspberry Cream Caramel, Berry Essence, Cranberry Orange, Bing Cherry with Almond, Hibiscus Flower, and a few others. How delicious do they sound? If you are a tea connoisseur, you will appreciate the ability to try several without buying a box; it's nice. 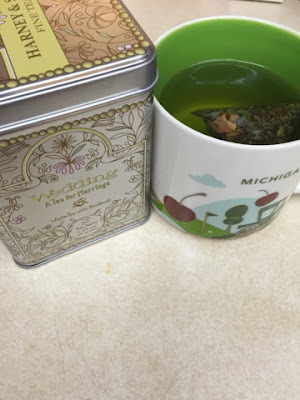 I am pretty excited about this new one that I purchased and loved, which I recommend buying if you like tea- it is called "Wedding- A tea for Marriage", but it sure is yummy. I would never think the combination of white tea, rose petals, vanilla, and lemon would be something I would like or drink anything of, but it is delicious. Who knew white tea would be so good? Whether you're in three feet of snow, dealing with tons of rain or have lovely warm weather, you could use a cup of hot tea or even a glass of cold sweet tea. Are you a tea connoisseur? Do you like tea? Are you a coffee fan? What is your drink vice? I'm also a fan of tea, but don't try that many different flavors. However, I do love lemon ginger and my decaf English breakfast every morning. I'm a fan of tea here as well! David's Tea is my hands down all time favorite! :) I love all of the flavor combinations they have come up with. It's neat that the store you visited allowed you to purchase one package at a time instead of a whole box! I agree that it stinks when you purchase an entire box and don't even like the flavor!